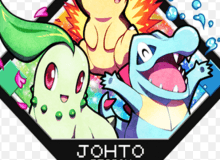 What Johto starter Pokemon are you??? Hey guys! It's Dovewingfan again! And I'm here with my second Pokemon quiz! This one is also a starter quiz, but this one's for the Johto region. It's still the same concept thou. Anyhow, like my previous quiz, this one will tell you what starter Pokemon you are. You are ethier Chikorita, Cyndaquil, or Totodile. The quiz resilts may not be accurate, but i made it just for fun. Dovewingfan: Hey 'yall!!! It's Dovewingfan!!! I'm here today to see what gen 2 starter Pokemon you are. Ok, the first question is the one we all hate; what's your favorite color??? Dovewingfan: ok, here is my Johto team! First up is my starter, Chica the Meganium!!!! Chica: hi!!! Ok, what's your favorite Pokemon region??? Dovewingfan: ok next up is Coral the Corsola!! !Coral: ok what is your favorite thing about Pokemon??? Dovewingfan: and next up is Espe, my Espeon!! !Espe: good afternoon. What Pokemon do you often choose as your starter??? The one with the highest stats! Dovewingfan: and here's Maree, my Ampharos!Maree: hello. What would you do if you saw a shiny Pokemon, but then saw team Rocket, and then saw your freind/rival getting beaten by the bad guys? Dovewingfan: and here's Fluffy the Furret!Fluffy: hey guys! Ok, where do you feel the most focused and/or relaxed? Dovewingfan: ok here's my last Pokemon... Lugi the Lugia!! !Lugi: sup. Ok, do you prefer Suciune, Entini, or Raicou? Dovewingfan: ok, what do you think of my quizes??? Dovewingfan: will you like and/or comment??? Quiz topic: What Johto starter Pokemon am I?? ?